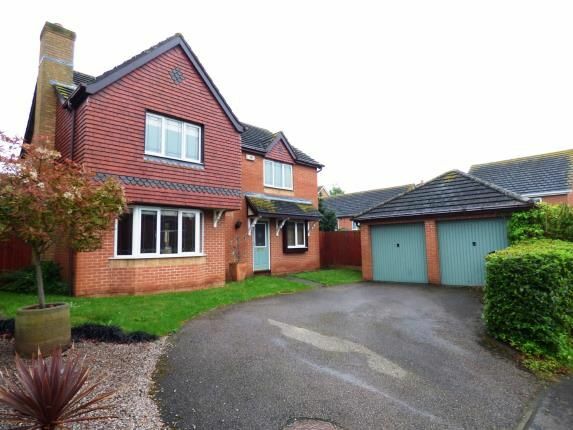 Taylors Estate Agents are very proud to offer for sale this well presented four double bedroom detached family home situated in the popular location of Hampton with easy access to the Serpentine Green Shopping Centre, City Centre, train station and A1. Hampton further more offers its own local community facilities, primary school and college. The property briefly comprises of an entrance hallway, WC, office, lounge, dining room, kitchen/breakfast room and a utility room. To the first floor there are four double bedrooms, a family bathroom and an en-suite offered off the master bedroom. The property further benefits from having a fully enclosed south facing rear garden, double garage and off road parking. Entrance Hall10'3" x 9'9" (3.12m x 2.97m). Hardwood single glazed door facing the front, radiator, solid oak flooring, built-in storage cupboard and coving. WC5'3" x 5'3" (1.6m x 1.6m). Radiator, tiled flooring, part tiled walls, close coupled WC, pedestal wash hand basin and extractor fan. Office8'11" x 6'5" (2.72m x 1.96m). Double glazed uPVC window facing the front, radiator, tiled flooring and coving. Lounge11'10" x 16'3" (3.6m x 4.95m). Double glazed uPVC bay window facing the front, radiator, gas fire and coving. Dining Room11'10" x 8'11" (3.6m x 2.72m). Double glazed uPVC door facing the rear, radiator, tiled flooring and coving. Kitchen Breakfast16'1" x 16'4" (4.9m x 4.98m). Double glazed uPVC door facing the rear, double glazed uPVC window facing the rear and side, radiator, tiled flooring, coving, roll top work surface, wall and base units, stainless steel sink with mixer tap, integrated double oven, integrated microwave oven, gas hob, over hob extractor, integrated dishwasher and integrated fridge/freezer. Utility6'9" x 5'3" (2.06m x 1.6m). Double glazed uPVC door facing the side, radiator, tiled flooring, roll top work surface, base units, stainless steel sink with mixer tap, space for washing machine and dryer. Landing6'6" x 13'3" (1.98m x 4.04m). Double glazed uPVC window facing the front and a built-in storage cupboard. Master Bedroom11'10" x 14'11" (3.6m x 4.55m). Double glazed uPVC window facing the front, radiator, two built-in wardrobes and coving. En-suite5'3" x 7'4" (1.6m x 2.24m). Double glazed uPVC window facing the rear and side, heated towel rail, tiled flooring, tiled walls, close coupled WC, walk-in double enclosure shower, semi-pedestal wash hand basin and extractor fan. Bedroom Two12'9" x 10'1" (3.89m x 3.07m). Double glazed uPVC window facing the front, radiator, a built-in wardrobe and coving. Bedroom Three12'9" x 11'7" (3.89m x 3.53m). Double glazed uPVC window facing the rear, radiator, built-in storage cupboard and coving. Bedroom Four9'9" x 8'5" (2.97m x 2.57m). Double glazed uPVC window facing the rear, radiator, a built-in wardrobe and coving. Bathroom6'10" x 8'5" (2.08m x 2.57m). Double glazed uPVC window facing the rear, radiator, close coupled WC, panelled bath, shower over bath, pedestal wash hand basin and extractor fan.